This dish is a family recipe from my godmother, Aunt Frances. It’s a comforting Italian specialty, simple and delectable. Feel free to substitute pancetta (Italian bacon). Either way everything taste better with bacon. 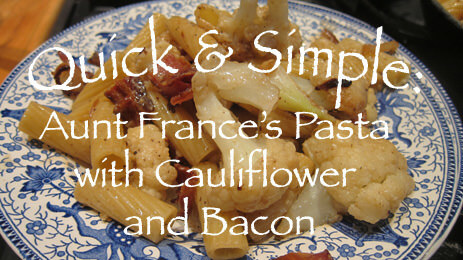 You can find the recipe for Aunt France’s Pasta with Cauliflower and Bacon here!